If you have a lot of money to spare on a tank, then a reptile terrarium or vivarium is a good option. Prices range from about £50 to hundreds of pounds, depending on the size you want. Vivariums usually have sliding doors on the front so you can easily get access to your snails and change the substrate. They are also attractive as they often come with stone or wood effect backdrops. Being made of glass, vivariums are also easy to keep at a constant temperature, which is important for African snails. A large reptile vivarium, suitable for most snails. Fish tanks are a more affordable option – they come in a wide variety of sizes, can be made of glass or plastic and can range from £10 for a small plastic tank to hundreds of pounds for a large glass one. One thing to bear in mind is that, unlike reptile vivariums, fish tanks open from the top, rather than the side, which can make changing substrate and cleaning more difficult. A small, plastic fish tank, suitable for small or baby snails. If you have less money to spend, a plastic storage box is a good option. These come in a huge array of sizes and can be bought in many places including hardware stores, pound shops, stationary shops and furniture stores. They cost around £6-15 for a large one. The problem with these is that they don’t often have any ventilation, so you will need to make holes in the lid before re-homing your snails. Also, it is difficult to find perfectly transparent storage boxes, although translucent ones do the job fine. 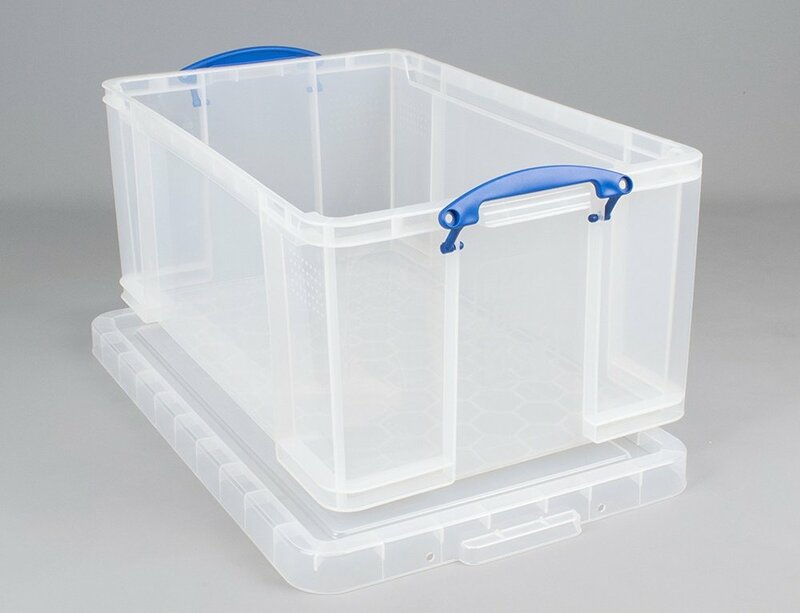 Because they are made of plastic, storage boxes are easy to move around and clean, although it is harder to maintain a warm temperature in them. A plastic storage box, suitable for keeping most sizes of snail. The larger your snails, and the more snails you have, the more room they will need! A small tank is fine for eggs and baby snails, but make sure you have a larger tank ready for when they get bigger. Obviously, the larger the tank, the more expensive it will be, so if you have a lot of snails a plastic storage tub is a wise choice. Your tank should be big enough to house a food and water dish and a cuttlefish bone and still have enough room for your snails to crawl around and burrow comfortably. How much space you have in your home is another factor you should consider before keeping snails. If you don’t have much room for a tank, then keeping just 2 or 3 small snails is a good idea. Once you have chosen your tank, fill it with substrate and re-homed your snails, they may take a while to get used to their new surroundings. Snails will often crawl onto the lid to sleep after a change to their habitat. Don’t worry, this is normal and they should settle into their new home in a week or two!